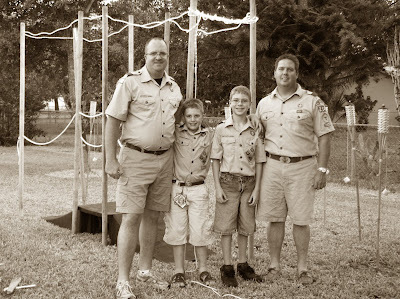 Last night, in our backyard, my son and his best friend, and my husband and his, along with three other boys, set out on a new adventure...Boy Scouts. 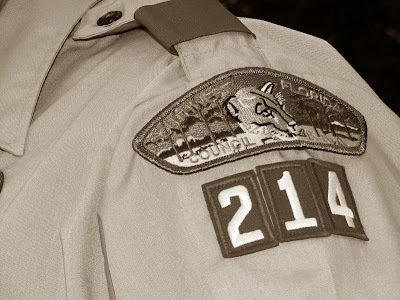 The ink is barely dry, but they are officially a brand new Boy Scout Troop... 214. I'm thrilled that my son will be take this journey with his Dad. The stage was set... a beautiful makeshift bridge... a roaring campfire... and seven torches representing seven virtues of life. I was proud of my boys... and all of the others, that worked so hard to get to this place. They are growing into young men... they stood still and listen as the virtues were read. Wisdom doesn't mean that you are smarter than others. It means that you use what you know to lead a better life. Courage doesn't mean you have no fear of danger. It means that you can face danger despite your fear. Self-control means being able to stop when you have had enough of something, such as eating, playing or even working too much. Justice means being fair with others as you play and work with them. Faith is belief in God and things you cannot see, but feel are true. Hope means to look forward to good things you believe will happen and work hard today to make them happen. Many kinds of love are important; love of family, fellow humans, God and our country. And then it was time for each to cross over the bridge, from Cub Scouts to Boy Scouts. Scoutmaster John & Assistant Scoutmaster Eric met them on the far side... to present them with their red epaulets and welcome them with a firm handshake. This is a big adventure, but one worth embarking upon... for all of them. There is so much to learn, and so much fun to be had! These boys are so fortunate to have these two men to guide them... men who have so much integrity, so much life in them, and men who really care about what happens to each of them.